Not long ago I did a giveaway for one of my books, The Crown Tower. I wanted to make it special...really special. So, I asked my daughter to personalize the book by doing a drawing in it. I thought she'd do a doodle of Royce or Hadrian...instead she did an excellent montage from the novel. It was so good that I thought I should share it with everyone. 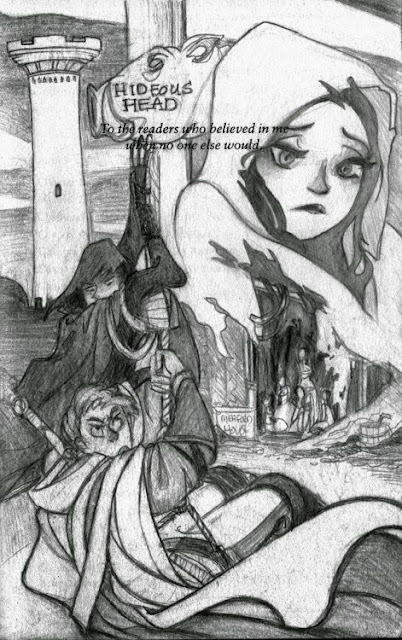 If you want to see some of Sarah's other Riyria inspired artwork, you can view them here. Hello, my name is Майкъл Дж Съливан...you killed my father...ah, okay, maybe not. Sorry, I couldn't resist. So, for those that didn't see my Facebook post, I recently discovered that Майкъл Дж Съливан is how the people of Bulgaria spell Michael J. Sullivan. I'd love to know how it is pronounced. That in itself is a new revelation...but I also discovered some covers that I didn't know about previously. When it comes to foreign translations, sometimes the author is the last to know. Yes, I'm aware of contracts I've signed but knowing when the books are released is another matter. I apologize to the people of Bulgaria for not being "up to date" on the releases of my books. But now that I know about them, I'm so pleased with how they came out, and I wanted to share them with everyone else. 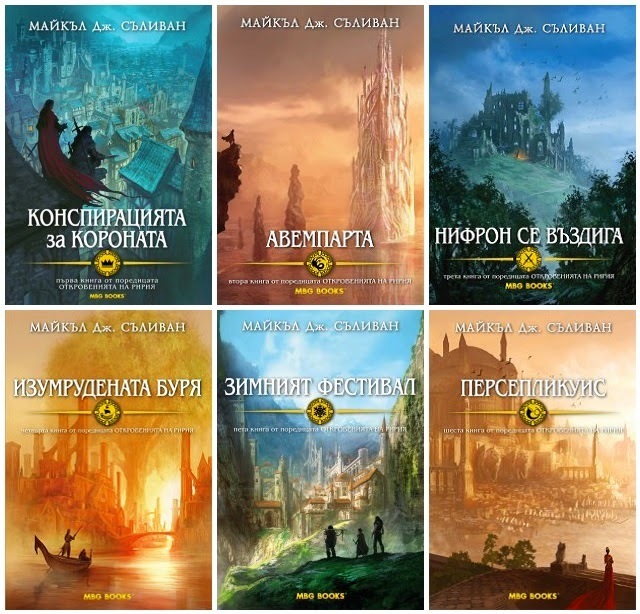 So first up are the covers for the six books of The Riyria Revelations. The covers are from the amazing Marc Simonetti. 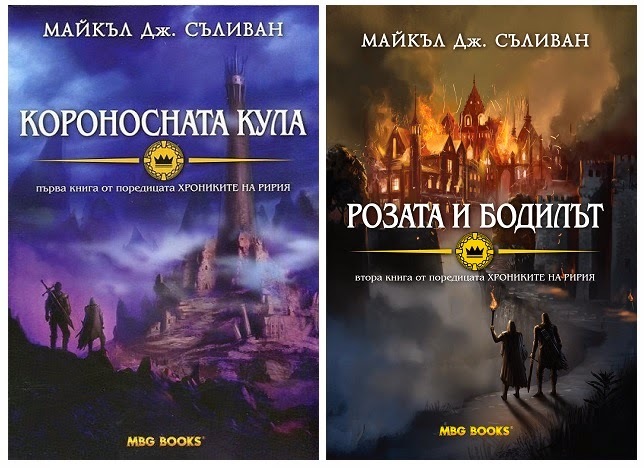 The first three were done for the French editions and re-licensed for the Bulgarian editions. But then the publisher from France decided to switch over from the "six book" versions to the "three book" versions so they didn't have graphics for the remaining three books. MBG Books was releasing the books quickly and needed a fast solution for the last three book's covers. So they picked some other images by Marc, of the series and so there weren't corresponding drawings for the other books. Thinking fast, the publisher utilized some existing art from Marc and all in all they work pretty well. With a little more time under their belt, the publisher commissioned covers for the two Riyria Chronicle books. I'm not sure who the artist is, but when I find out I'll let you know. I really like them. The first depicts the famed Crown Tower, which Royce and Hadrian scale on their first job together. The second one I can't tell you what it depicts, as it would be a spoiler to the book. But those who have read Revelations could probably guess about what "past fire" it shows. where she highlights books focusing on and celebrating disabilities in science fiction and fantasy. What a great idea! Yesterday, she came out with the best books in 2014 and I'm thrilled to find Hollow World on it. That's the twelfth time my little science fiction project has made a "best of" or "most anticipated list." 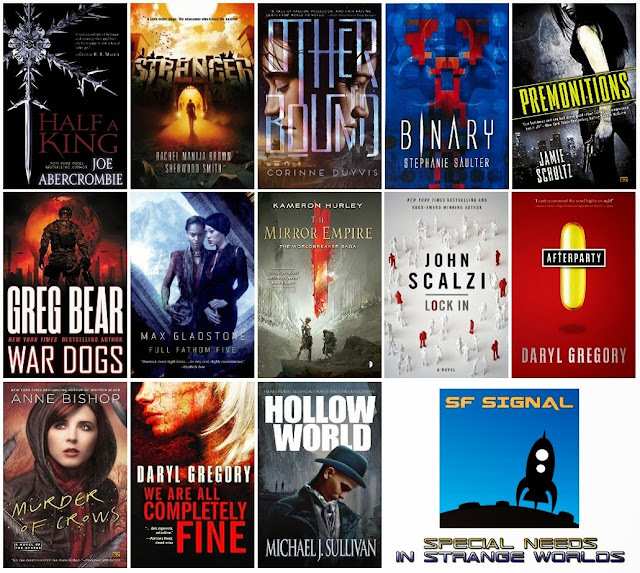 So if you like characters who are slightly off the norm, then check out some of these books...and tune in for Sarah's ongoing column where she reviews books and interviews author's. I've found some very entertaining reads through the column. 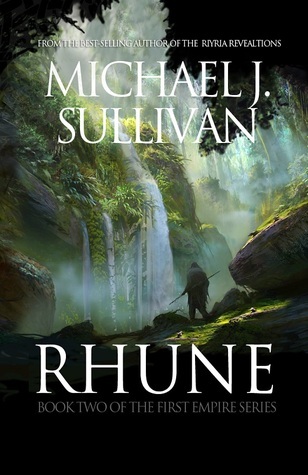 The giveaways for the limited edition copies of Rhune are going AMAZINGLY well. I'm so glad people are excited for this new series. 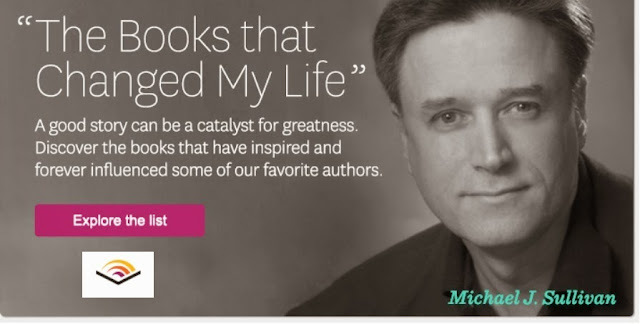 There are already more than 3,000 people signing up on goodreads. How crazy is that? All giveaways are open to people from all countries, and you can enter in all four to increase you chances of winning. Anyone who knows me, knows I'm a huge fan of Kickstarter. I've only done one so far (for Hollow World) and it was a huge success. My plan was to raise $3,000 and by the time it was done, I had raised more than $32,000. Part of why I did the Kickstarter was to prove to myself, and other traditionally published authors, that a Kickstarter might be a great way to launch their own works. The acquisitions editor left the company and the new editor assigned just isn't enthused. To me these are GREAT reasons to run a Kickstarter! Today, I'm here to tell you of one such case. 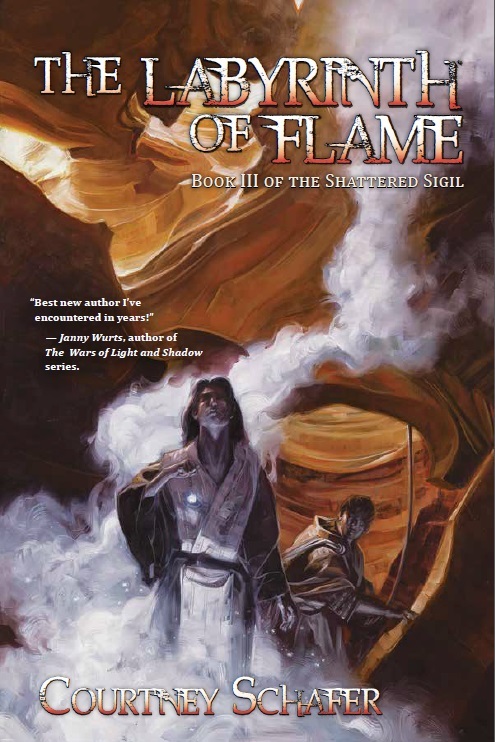 And it's for the book The Labyrinth of Flame by Courtney Schafer. Courtney was one one many authors who went were published through Nightshade Books, and ran into any number of hiccups because of it. For those that don't know, Nightshade ran into some hard times, as many small presses do, and as it neared bankruptcy it sold it's assets (author's books) to two different entities (one who handles print, the other who handles ebooks). 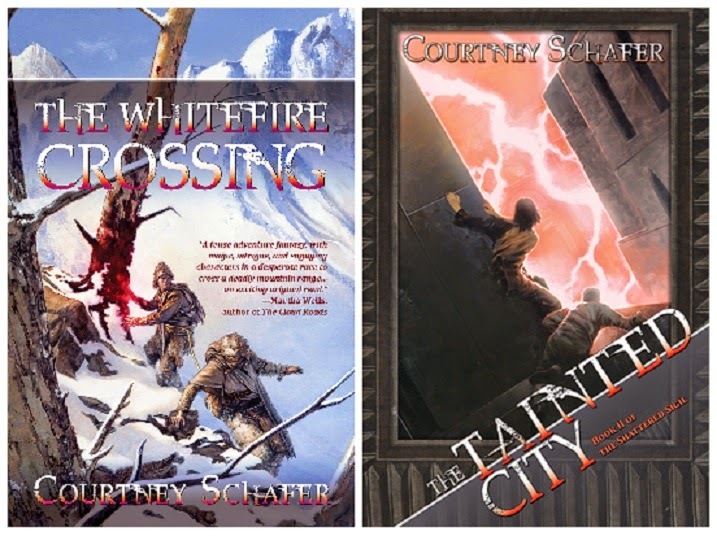 At the time, Courtney had already signed the first two books of her series to Nightshade (The Whitefire Crossing and The Tainted City) who released them. But given what had been going on in the series, she retained her rights to the third and final book...you guessed it. The Labyrinth of Flame. Courtney did the best thing she could do in such a situation. She took control of her own intellectual property, decided to release it the BEST way possible, and started a Kickstarter to help fund the process. Hence, the Kickstarter was born! Courtney is self-publishing "the right way" - by hiring the same professionals that worked on the traditionally-published versions of her books. So you can trust that the quality will be "top notch" because the Kickstarter has helped to make that so. Courtney has already funded, which I knew she would, and now comes the really exciting time...reaching stretch goals. This is where backers can get extra special things that are just really hard to do in anyway outside a Kickstarter. Her first goal is to reach $6,000 and that will unlock a short story created from the point of view of a character of the backers choice! (There will be a poll to vote on). 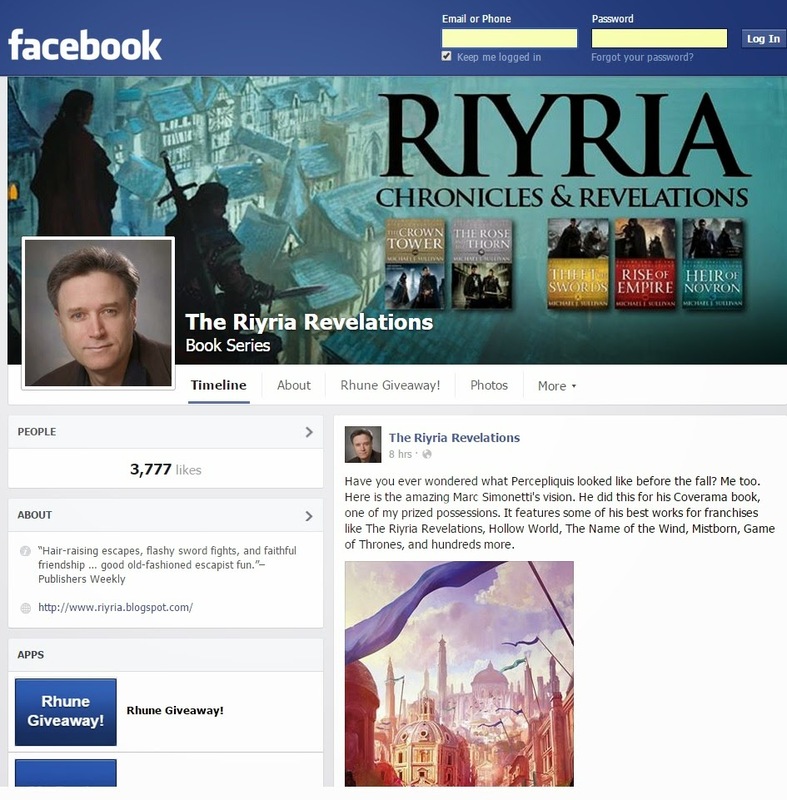 Third Riyria Chronicle planned for 2015 - Welcome back Royce and Hadrian! This shouldn't be a surprise to anyone, as I've talked about in other posts and various forums (goodreads, reddit), but I'm making an "official" announcement. There WILL be a third Riyria Chronicle book, and if all goes to plan, it will be released in 2015. Let me back up a bit and discuss the existence of a third book. When I wrote the first two books in the Riyria Chronicles, I did so knowing there was a very real possibility that they would be the only books in this prequel series. The reason is simple...I didn't want Royce and Hadrian to overstay their welcome and be "that guy," the one who doesn't know when to stop and winds up ruining something that was once enjoyable. So, my plan then, as now, is to release a book, and then put my ear to the ground and see if there is still interest in more. If there is, then I have plenty more stories that I would love to share. If not, then I'm grateful for the time we've all had with these lovable rogues. 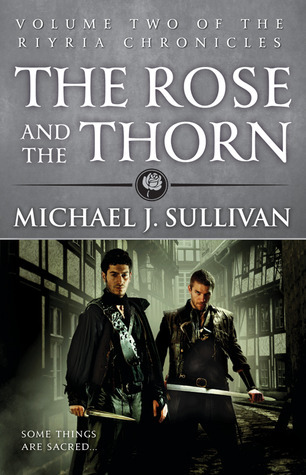 It didn't take long after the release of The Rose and Thorn to determine that the readers still wanted more, but the question was when and how. As most know from other recent announcements, I've been busy with The First Empire. Writing this series turned out to be a longer project than I anticipated (growing from 3 books to 5). Now that I have the publishing details of that project determined (sold to Del Rey for release in the summer of 2016), I can turn my attention to the release of this third book. Since Rhune's release won't be until the summer of 2016, that left a big gap (more than two years) between it and my last book. Releasing the third Chronicle between during that time becomes the obvious choice. Because this book is not yet written, there is no way I could use traditional publishing and have it released in 2015. So, I've decide to self-publish this release, and shoot to have it out later this year. 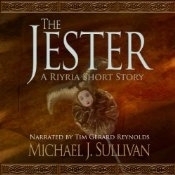 While I'm making this announcement, I should also discuss the audio book version. I'll make a more detailed post tomorrow, but for now let me just say two things. First, the audio rights for this title have been sold, and the intention is to release it simultaneously with the print/ebook. And secondly, Tim Gerard Reynolds has been attached to the project, and he will be doing the narration. Oh, and two last things I should mention...I do plan on having various pre-sales promotions for this book: giveaways, signed copies, bookmarks, bookplates, sample chapters, short stories, etc. If you want to be notified of such things, then you can sign up at this link. Also, if you are on goodreads, you can already add the book to your shelf by clicking on this link. There are two very good reasons for doing so. First, goodreads will notify you when the book is officially published, so you won't have to keep checking back with me on that date. And second, some of the promotional giveaways I mentioned above will have "extra" entries for "early adopters." For instance, those that shelf the book in February may have five entries in drawings while those in March might get four and those in April three, and so on. Well, that's about all for now. As you can see, it's been a very busy time for me...and Robin (who handles all this "business stuff"). But I'm trying to keep everyone updated as soon as possible. Tomorrow I'm going to dig a little deeper into the audio side of things. Until then, I hope you are as excited as I am about more Royce and Hadrian. Well, some lucky people will be able to. I printed up a few copies of the "beta" version of Rhune and these signed, numbered, and limited edition copies will be available through a number of giveaways. 1 copy to members of the "Dark Room"
Most of these are pretty straight-forward, but I should explain "The Dark Room" a bit. This is a secret and private group on goodreads for fans of my writing. Because it's secret, it doesn't show up on your group list, and any posts you make in it don't appear in your friend feeds. The fact that it is private means you have to be invited and approved...which I'll do as part of this giveaway. It's a really cool group, and I hope you'll join us there. So yes, the final book will be different, and yes, you will find typos and grammar issues, but it's still "pretty clean." For the winners, they'll be able to see the difference between an interim and the final version that won't come out until the summer of 2016. So what is the book about? Well, here's the initial "back of the book blurb." The First Empire is a standalone series, and all five books were written before the first one was published. While set in the same world as the Riyria books, it takes place thousands of years in the past. As such, no prior knowledge is required to enjoy the book to its fullest. For those who have read Riyria, you’ll discover certain details about Elan’s past weren't entirely accurate—the difference between myth and reality. Now you can learn the true story of how Novron/Nyphron saved mankind from extinction and founded the First Empire alongside Persephone, the love of his life. Books in the First Empire include Rhune, Dherg, Rhist, Phyre, and Fhrey. Note: Covers and titles are interim only, and final versions will be produced by Random House's Del Rey design team. I don't think there is any honor greater than having someone name a child or beloved pet after one of your characters. 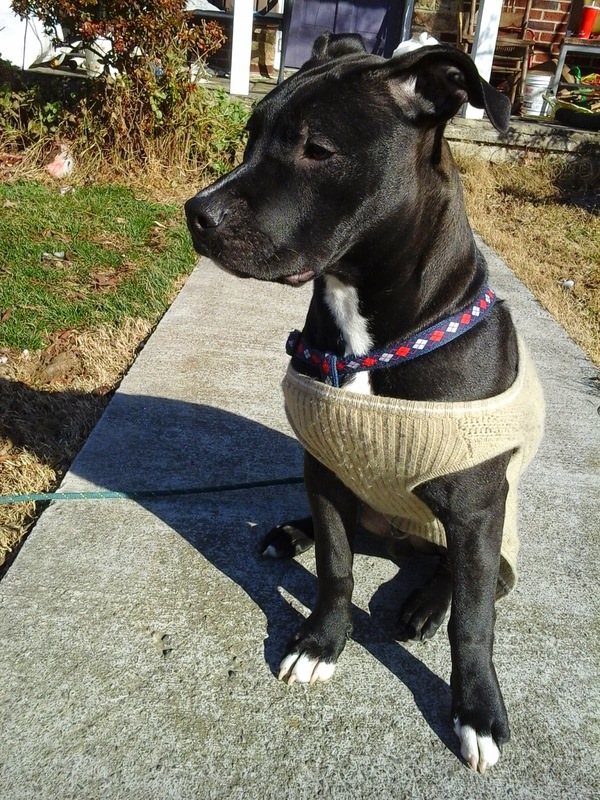 Some time ago on Facebook, I was contacted by Andrea, who had recently named her new black dog, Royce. 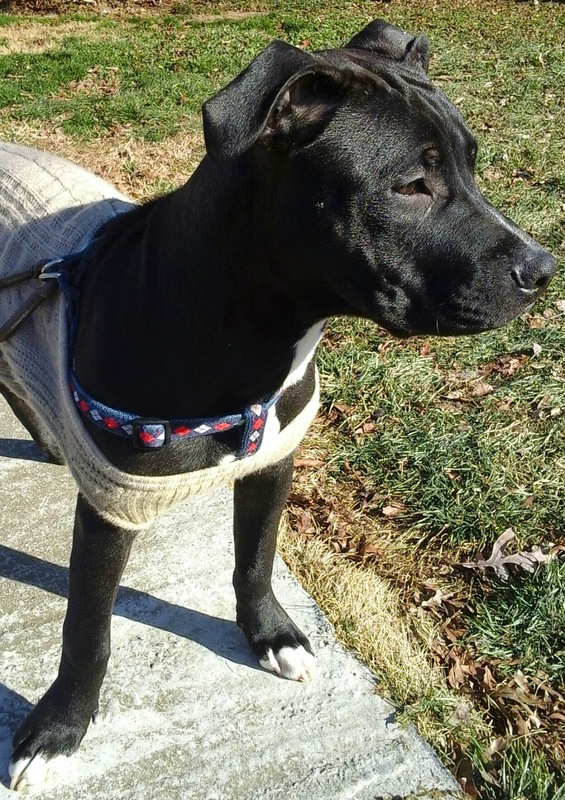 Well, it's been a few months and Royce is now almost seven months old. Oh, where does the time go? 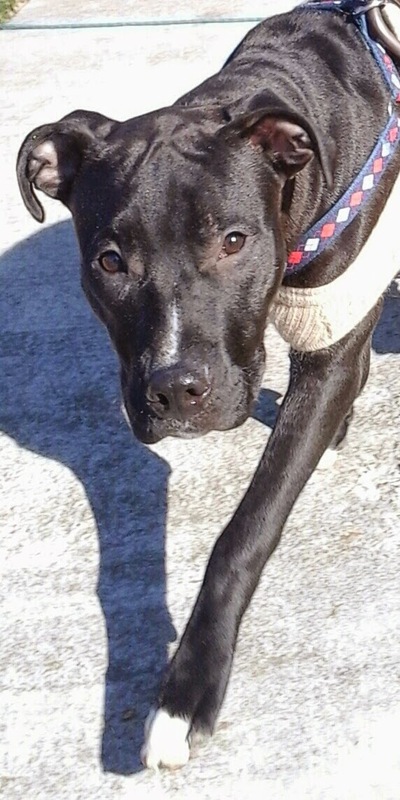 She was nice enough to share some pictures of her "Royce", and they were so adorable I asked if I could share them here. So, without further ado, I give you Royce as you've never seen him before, all he needs is a hooded cloak, but that would obscure his wonderful face. Now, I need to take a step back and explain something for those people who aren't familiar with how I write. Before the first book in a series is released, I write all the other books so I know where the whole story is going to wind up. (An exception for The Riyria Chronicles which isn't so much a "series" but a string of books with the same characters.) But there is a big difference between "written" and "ready for publishing." I mention this because it relates to release dates. So, since so many people have been asking about those, let me fill in some details relating to when the books will come out. Knowing that I write the entire series, the first question people are asking me is, "Why is it taking so long to release the first book? Does it really take a year and a half?" Well, let me explain. In general, a publisher needs a year (or sometimes longer) to do all their magic, including editing, cover design, promotion, early reading copies, and so forth. But at this time Del Rey can't even start any of that stuff. So while the "waiting clock" is starting to tick for the readers, the "production" clock hasn't yet started for the publisher. So why can't they start? Well, several reasons. We don't have a signed contract yet. All we've done is agreed on the "big items" but until we both have signatures on paper, it makes no sense for them to start working on a project. Del Rey doesn't have the "official manuscript" yet. What they have is what I sent them in January, with is essentially the state of the book as it entered the second beta. Okay, so let's dig a little deeper and explain what will need to happen from here. Let's start with the contract, it can take weeks to get it to me, then the parties will "negotiate" minor aspects of each clause. We've already agreed on the "big items" but getting all the i's dotted and t's crossed could take months. For the Orbit deal, I think we agreed on terms in October 2010 and signed in March of 2011. As to the "official manuscript," I'm still writing the last book. If all goes well, it'll be finished in April or May. But until that story is written, I don't want to give Del Rey a manuscript because I might need to make changes. In fact, I already know of a few things I need to adjust, but there is no reason to start those until after I finish the series. Plus, the second beta is finishing up and Robin has a number of changes for me to consider from that. Again, I want to work on Rhune (book one), and once I have all the facts I will. Given what's outstanding I predict that the earliest Del Rey can have their "official manuscript for acceptance" will be June or July. So their plans to release in Summer 2016 is in line with a "year after the book is received" timeline. What will be the interval between books? Because all the books are written, there are a lot of people who are expecting to read them in quick succession. 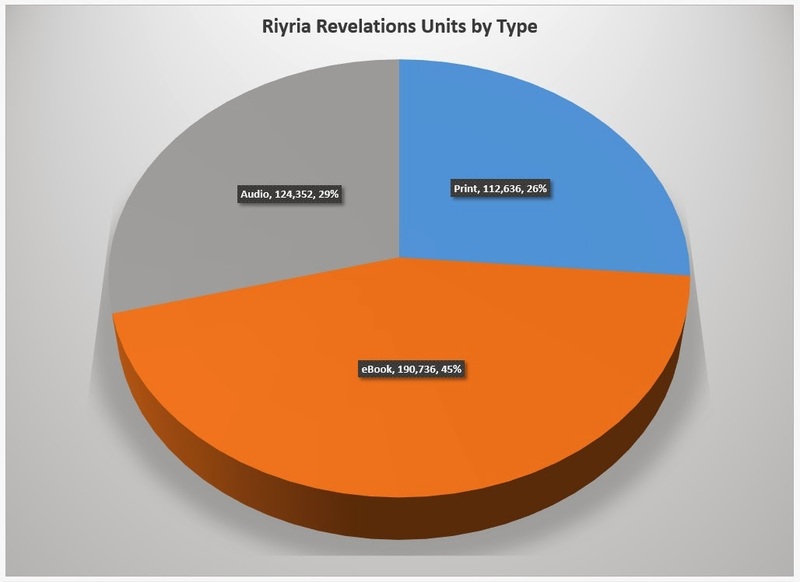 This is probably complicated by the fact that Orbit released all six books of the Riyria Revelations in a 69 day period (Nov 2011 - Jan 2012). I should point out that there is no bit difference between The Riyria Revelations and The First Empire. First, five of the six books of Revelations were already published when Orbit was handed them. So they were fully edited at contract signing. Yes, they still had to do their structural, copy, and line editing, as well as final layout and proofing. But they were fully polished when we signed. The books of The First Empire are not at that level at this time. And as I stated it still needs another round of edits from me before submission. But books two through five have only had their "alpha read" completed. All those other steps are still pending. I don't have a list of issues yet, and even if I did, I couldn't start working on them now. I still have to finish the last book and make the changes to the first book. The alpha critique can take several months to finish, and the beta read process generally takes three months as well. Because there is only one of me and Robin (who does the alpha reading and organization of the beta), alpha), we have to work serially, not in parallel. The other thing to keep in mind is that Del Rey is doing both a hardcover and a paperback release. Generally, there is some period of time between these releases...and that also has to be taken into consideration. Maybe I'll discuss the reasons for this in a future article. But in any case, they need some distance between these two releases. Right now, my focus is on book five and soon it will shift back to book one. Once those are done, and I know what changes will be required, the people at Del Rey and I will discuss the various possible release schedules for the other books. Then, I'll work backward from those dates to ensure the other books are ready by the deadlines we come up with. This is another factor that will affect the release dates. I'm constantly being asked by readers for more Royce and Hadrian (Riyria) and additional stories featuring Ellis and Pax (Hollow World). I really don't want to put off those readers while The First Empire is being rolled out. Ideally, I'd like to progress each of the three series a bit at a time. So, my plan is that between First Empire books, I should be able to release other titles. But this can only happen if there is a "distance" between the First Empire stories. It's important to me that my other projects don't interfere with Del Rey's marketing efforts. The way to prevent this is to have a "window" around their release dates, in which I won't put out my other books. I did this with Orbit and I plan on doing that with Del Rey as well. So, since the books can't come out in back-to-back months anyway, I'll be putting out my other books in the gaps between their books. Make sense? How big of a gap will that be? Again we haven't finalized that yet, but the bottom line is I plan on having a steady stream of books by both me and Del Rey to keep the readers "well fed." I know that really didn't help much as far as exact release dates, but hopefully it helps to describe the process and some of the details about how such things are determined. Of course, as soon as I know more, I'll let you all know. The announcement was made official yesterday in Publisher's Marketplace so I can now openly talk about this. My new series will be released through Random House's fantasy imprint Del Rey, and I couldn't be happier! Since that news is now out, I can also announce the audio deal, which was actually inked last year. I wanted to keep it on the low-down until we made it through the print/ebook acquisition process. If you would like to read the official press release put out by my agent, you can read it here. The books will be released in hardcover with simultaneous ebook and audio releases, a paperback version will follow afterward (I'm not sure of the timing on those, yet). Del Rey has the English print and ebook rights, Recorded Audio has the English audio rights, and now that the announcement is official, my foreign rights agent will start working deals for translations. Tim Gerard Reynolds will be the narrator for these books. I had three publishers vying for this series, and for each I had only one requirement...Tim had to be the narrator. The publisher I went for values both mine and Tim's work, and even sweetened the deal by kicking in some extra income for Tim. 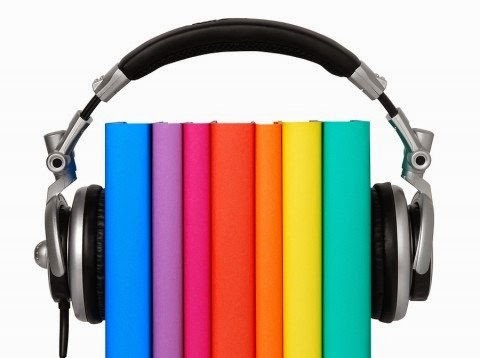 The audio book producer, will once more be Recorded Books, and they will be put into a special program, which will mean a much larger library distribution than the Riyria books. More on this at a later date. 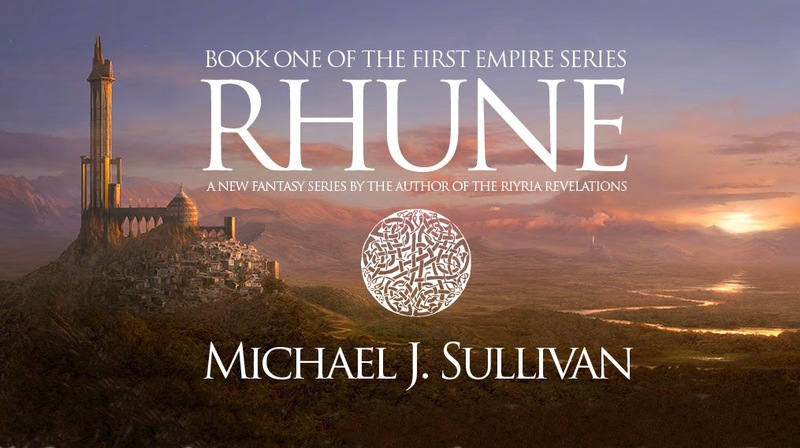 Release dates are still being worked out, but the first book, Rhune is tentatively set for Summer 2016. That sounds like a long time, but really it'll only be a year from when I'm able to supply them with a "final manuscript." More on this, and the timing of subsequent books, in tomorrow's post. The fact that these books are being published by Random House and not Hachette isn't because of Amazon/Hachette dispute last year. Although I can't deny that being with the biggest publisher in the world, who has more leverage wasn't "part" of the decision. The fact that these new books aren't published by Orbit/Hachette is not an indication of dissatisfaction between the two of us. Like the audio books, I had one requirement for this new series. I wanted to "take my career to the next level" and this meant a hardcover release. I think Orbit was right to put the Riyria books out as trade paperbacks, but I had no interest in doing that with The First Empire Series. Sometimes a writer's vision for their career doesn't align with the publisher's. There is no harm or foul in such determinations. Fortunately, other publishers agreed with my vision. I'm sure I'll have more posts about this deal, and what it means for the First Empire series and my other projects, but these are the high points that I wanted to get out today. Stay tuned for more! Not to mention a whole bunch of "other useful things." If you are thinking of querying agents, it's worth getting an account to see who is selling has sold what to where. It costs a reasonable $25.00 a month. We are closing in on the final production of the Blackguards Anthology. For those that don't know this was launched with a Kickstarter from Ragnarok Publications. Just a bit over 17 hours left in the Hollow World Giveaway. My parallel giveaway (those outside the US, Canada, and UK have two chances to win when entering this one.